I was needing in last minute and they worked me in. Friendly staff and quick. Literally the best doctor ever! We love Kevin and his staff! Great bedside manner and has advocated for us if we had to go out of town to see a specialist! The staff is always so friendly and helpful with any questions or concerns I may have. Mr. Salas bedside manner is also excellent he's always available to answer any questions I may throw his way! Kevin and his staff were great! This was my first visit and everyone was friendly and eager to help. I like that Kevin listens and truly cares about his patients. The nurses and staff are nice and when I'm sick they try to fit me in that day. Nurse are very nice & helpful asking questions for your visit. The ladies at the front are also very nice. And the doctor couldn't ask for any better! One on one care that truly matters to them. I would highly recommend their services to family and friends. This is the only clinic in the area I will go to. Wait time is always minimal even without an appointment. A++ service. Great experience. Fast and friendly and they listen to everything so they can help you better. Staff is very friendly, willing to help. The doctor is sweet and very much a people person. Mr. Salas is an Advanced Practice Registered Nurse certified as a Family Nurse Practitioner by the American Academy of Nurse Practitioners. Mr. Salas was born and Raised in Midland, Texas, He graduated from Lee High School in 1996, is married to Jessica Salas with three children and one grandbaby. Mr. Salas received his Paramedic License from Midland College in 2002, followed by his RN license in 2006 at Midland College, received his Bachelor's Degree in Nursing in 2008, and his Master's Degree in Nursing in 2012 at Texas Tech University Health Sciences Center. He also has credentials from the National Registry of Certified Medical Examiners to perform DOT physicals. Mr. Salas is also certified in OSHA 1910 standards as well as OSHA standards for hearing conservation. As a paramedic, Kevin began his career at Midland Memorial hospital in the Emergency Department. As a Registered Nurse, Kevin began his career with Medical Center Hospital as an ER nurse and progressed to Emergency Department Director. In 2009, Mr. Salas changed his career path and entered the field of Flight nursing with Care-star in Odessa, Texas. While working as a Flight Nurse Mr. Salas worked towards obtaining his Master from Texas Tech with an emphasis in Family Nurse Practitioner. Mr. Salas has a total of 15 years of medical experience specialized in emergency and trauma. He also holds certifications in Advanced Cardiac Life Support, Pediatric Advanced Life Support, and Advanced Trauma Life Support, Critical Care Emergency Medical Transport Provider, Nationally Registered Certified Medical Examiner. Outside of work Mr. Salas enjoys coaching his daughters in softball, playing golf and spending as much time as he can with his family. Courtyard Family Practice offers the West Texas community excellence in healthcare through a wide range of primary care services provided in one convenient location where accessibility, affordability and cost-efficiency are core values. Our solo provider practice is comprised of West Texans that not only understand the unique health issues of the community but also integrate their West Texas heritage into clinical practice to address individual patient needs and tailor care to support patients in identifying and achieving their best health. At Courtyard you can count on seeing the same provider each visit and be assured they are familiar with your specific history and health needs providing greater continuity of care and overall satisfaction. At Courtyard respect, communication and collaboration are cornerstones. 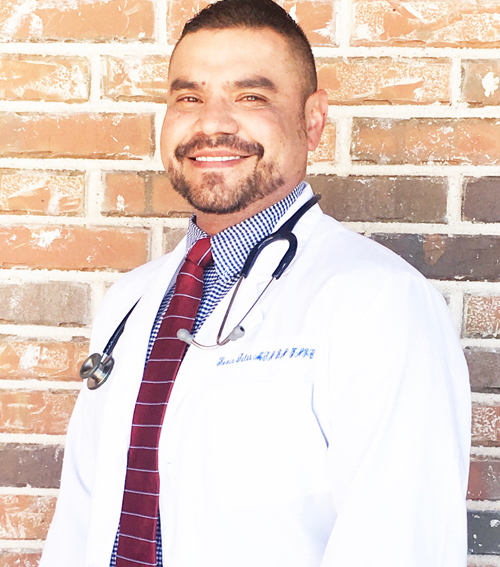 As a Midland native, Kevin Salas, APRN, FNP-C is devoted to the Permian Basin population and considers each patient as valuable as a family member. His clinical background in both the Emergency Department and as a member of a successful group family practice has provided him the clinical skills and medical knowledge essential to providing the highest level of care. Kevin combines these with unique insights into the opportunities and challenges of healthcare delivery in various settings along the continuum of care as he leads the Courtyard team with the goal of becoming the premier primary care practice of the Permian Basin. He strives to provide patients personalized care as if each individual were his only patient whether they are seen episodically for unexpected ailments like a common cold or more frequently for chronic conditions that provide him the opportunity to partner with patients to improve health and reach their longer term goals. For urgent complaints that occur after hours or on weekends that can't wait, please go to Vital Care Urgent Care for treatment by a medical provider. ABEM facilitates the LLSA 2019 articles by identifying an annual set of 2019 LLSA articles to guide diplomates in self-study of recent EM literature. For your own benefit and to make your preparations easier, go through the Hippo EM Board Review and get the enlightenment required for your LLSA exam without wasting your time. The ABEM board (American Board of Emergency Medicine) was designed to promote continuous learning by ABEM diplomats. ABEMPrep facilitates this learning by identifying an annual set of 10-15 ABEM exam readings based on the EM Model to guide diplomats in self-study of recent EM literature. The ABEM examination readings are designed as study tools and should be read critically. The ABEM Concert Exam 2018 registration is available from March 1 to August 9, 2018. ABEM recertification readings are designed as study tools and should be read critically. They are not intended to be all-inclusive and are not meant to define the standard of care for the clinical practice of EM. Midland Family Practice practitioners are leaders in their respective fields and nominated examiners to their respective faculties. When choosing a health care provider for you and your family, choose a Family Practice Texas provider. Looking for a compassionate, diet programs Midland? You�ve come to the right place. The physicians at Family Practice Midland Texas would love to get to know you and your family better. Sign up today for a midland family physicians and get advised by best family doctors. If you are looking for an affordable app developer to build an app for your company, you must have heard of Kolweb, if you haven't; you're missing out on the Affordable Ecommerce website Developers Kolkata can give you, as they are the professional app developers India at affordable prices. Kolweb meets deadlines 100% and makes sure that what was promised is delivered. Are you using your phone as a tool to reach your health and fitness goals? With the Count My Reps pro fitness app, you will be able to smash all your fitness goals. It is not just best workout app that helps you with your workouts but it is also the best Personal Trainer App for all your exercises. It helps you to concentrate on your exercise while it counts for you. Interior Designers India have a variety of commercial interior designs which includes big projects for Bharat Petroleum, the German Consulate and many more in India alone. Anjan Gupta is one of the best among the Architects in India and has drafted and managed many projects like this. There has never been a more important time to associate with Best Business Advisory Kolkata who are dedicated to growing your business profitably. This team of tax consultants, advocates, Financial advisors offers Best Business Advisory to the manufacturers, Traders, Dealers and service providers of the industry. There are a handful of emergency care centers in Midland. The Vital Care Urgent Care is one of the urgent care walk in clinics Odessa that serves the Midland and Odessa areas. This urgent care solution will provide high-quality general medical and emergency treatments by Odessa emergency walk in clinic whenever you need. Forget the stress of emergency room visit or long waits for an appointment. Along with the economic growth in India, Top Indian Architects are in high demand. This can be great for the future of young students studying architecture. Interior Designers Kolkata keep in mind the importance of orientation of a building that is not only for saving energy but also to have a better house design. The Emergency Medicine In training Examination (also known as the In service exam) is administered by the ABEM. All resident classes take the same exam which is based on the knowledge and experience that a third year resident should have acquired. The In Service Examination is derived from ABEM�s Model of the Clinical Practice of Emergency Medicine which outlines the scope of the EM specialty. Examination While in Residency or Prior to ABEM Certification: Individuals who have not yet completed training in emergency medicine (EM) or not yet achieved ABEM Certification may enter this pathway and apply for and take the SCC Certifying Exam upon completion of their SCC fellowship. Certification in SCC will not be granted, however, until Recertification LLSA is achieved. Candidates are responsible for providing documentation of ABEM certification to the ABS. The ABEMPrep is your gateway to resources that will help you score more on the ABEM examinations and fulfill your CME requirements. Some of these resources are available to all ABEM diplomates, and is recommended for the ABEM Exam. The Courtyard Family Practice Midland promotes wellness by providing information on how to make healthy lifestyle and healthcare decisions including BioTe Hormone Replacement Therapy, weight loss program and diet program in Midland. Midland family physicians are trained to care for family members through all stages of life. Midland Family Physicians was created to ensure you receive the most comprehensive, preventative and proactive health care services from our team of experts. We are a private Family Practice Texas group dedicated to serving our patients with the highest quality care in a professional and compassionate manner. Family medicine midland provides services for the entire family to promote and ensure a healthy life. Family Practice Texas is centered on providing lasting, caring relationships with patients and their families. Family Physicians specialize in caring for the physical and emotional well-being of their patients and their families in this Family Clinic Midland Texas. They are trained to care for family members through all stages of life. Family Physicians really know their patients, understand the impact of their health history and situation, and take the time to listen and help. "Thank you for taking the time to visit our Family Practice walk in clinic Midland. We are a family walkin clinic Midland and are excited about the opportunity to serve you with your healthcare needs. The Courtyard Family Practice Midland emphasizes wellness and self-care by providing information that you need and how to make healthy lifestyle choices and healthcare decisions. Like any other Family practice clinic midland, we are committed to providing the best quality healthcare. 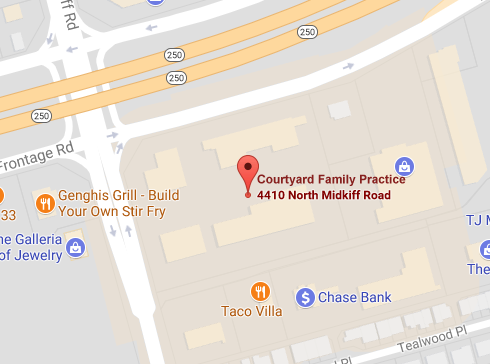 Please take the time to browse through our website www.courtyardfamilypractice.com and familiarize yourself with us and our Family Practice Midland Texas."